Happy Monday, everyone!! This ruffle eyelet top is one of my favorites from the fall launch of my clothing line that dropped last week! I love it so much that I’ve worn it THREE TIMES in the past week (twice with jeans and yesterday to church with a white skirt, see above)!!!!! It’s a super unique, feminine and versatile top. The fabric and ruffle detail make it so elevated and beautiful!! I hope you all have a lovely Monday, thanks for stopping by! These boots are amazing, love them! That bag and shoes are a perfect combo. I love the top and the boots! Great and chic outfit(s) … the shoes are just fabulous! I am so in love with this top- it’s perfect!! This top is gorgeous! 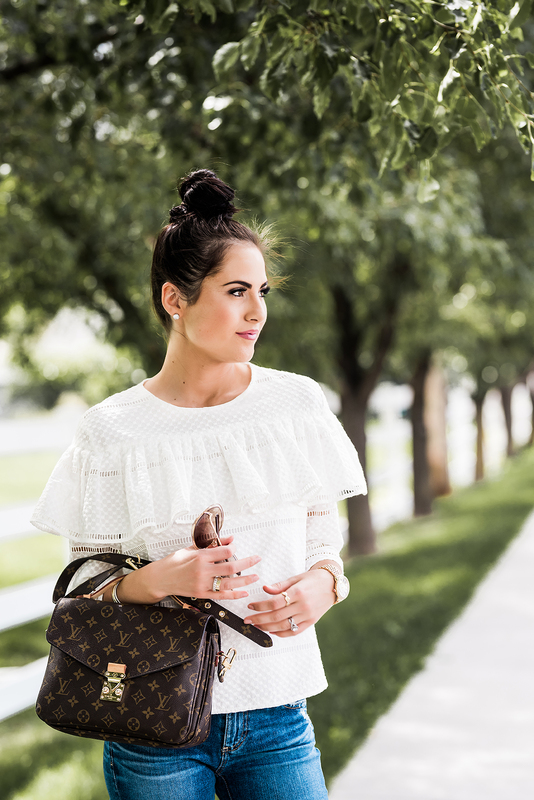 I am in love with ruffled blouses this season. ME TOO!!! It’s a trend I’m loving! Seriously such a cute top!! That top is really cute! So feminine and girly with the ruffles! I am so in love with these picks. Rach I LOVE this top! I love when you find something you just want to wear everyday! Also, those shoes are amazing too. Those boots are so chic! Love that it can be styled several ways! Love these booties! They’re on sale right now at net-a-porter! Yes they are!!!! I’m obsessed! I could never get tired of this top Rachel! I love the ruffle details and your boots are to die for! Thanks Deborah!! You’re so nice! Such a cute top! Also I love the wash on these jeans you’re wearing. Thanks Taylor!! I love these jeans! I got them at the Nordstrom Anniversary Sale. You’re looking absolutely flawless here! Great casual outfit. Thanks Pam!! You are so sweet! Rachel, that ruffle top is absolutely gorgeous! I need something like that for Spring! Thanks Sarah!! I know! It would be super cute in spring too! Love your top but I am swooning over those booties! They are the real MVP! And the way you styled your top in so many ways is very creative! It’s a very versatile piece! I love this looks!! Especially the sunglasses!